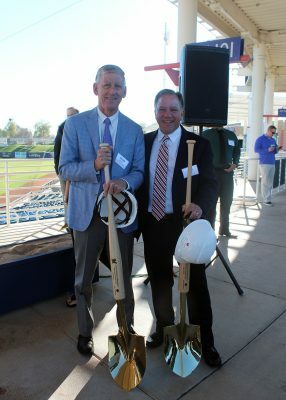 GCU president Brian Mueller (far right) joined other officials at a groundbreaking ceremony Tuesday for the construction and renovation of Maryvale Baseball Park. “Magical” was the resounding word guests used to account for the good news at the ceremonial groundbreaking at Maryvale Baseball Park on Tuesday. 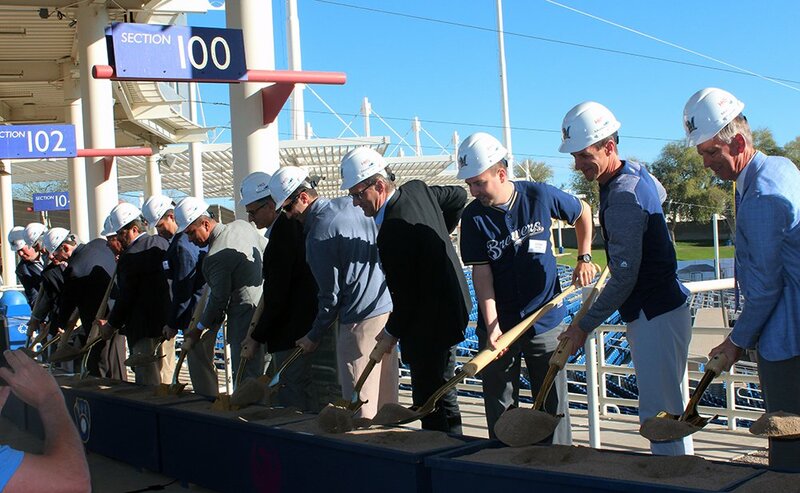 The Milwaukee Brewers, along with officials from the City of Phoenix and Grand Canyon University as well as other community partners, all gathered to celebrate the renovation and construction project for the team’s spring training home in Phoenix. GCU President Brian Mueller and the Brewers’ lobbyist in Arizona, John Kaites. In November 2017, the Phoenix City Council voted to renovate the complex, where the Brewers have played every spring since 1998. The plan keeps the club in Maryvale through at least 2042, the second-longest commitment in the Cactus League. The Brewers will commit $63 million for renovation and development of the complex, including a dedicated Learning Lounge space. As a result, local school districts, students and families all will be able to take advantage of the academic-assistance services GCU offers. Phoenix City Councilman Daniel Valenzuela was on hand to remind guests how collaboration brings a “special” city to life. The speeches of the day were filled with gratitude and confidence, from dignitaries to influential individuals who have played a role in the delivery of the project. Rick Schlesinger, the Brewers’ Chief Operating Officer, talked about the three-fold vision of the club. The Lounge is a large, welcoming space where students can curl up on couches to read, work one-on-one with GCU learning advocates (LEADs) or do their homework on computers. The idea is to have a building of 3,000 to 5,000 square feet identical to the study area at GCU’s main campus. 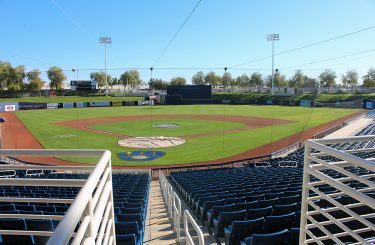 The Brewers plan to have the new Maryvale Baseball Park open in time for spring training 2019. Mo Stein, an architect with HKS, said, “I know when something is special and I know when something is a project. This is a very special opportunity. Shari Stagner and Dr. Joe Veres, of the Learning Lounge were filled with gratitude, joy and disbelief. “This is a special day for the kids in Maryvale, and we’re over-the-moon excited about that,” Stagner said. The Learning Lounge was introduced in partnership with nearby Alhambra High School in 2012 as part of GCU’s Strategic Educational Alliances Department and the University’s five-point plan to revitalize west Phoenix. GCU President Brian Mueller approached Kent Scribner, Superintendent of the Phoenix Union High School District, to see what the University could do to help Alhambra, less than a half-mile west of campus. Students at Alhambra, where more than 40 languages were spoken, had challenges with understanding English and staying in school. The program provides free academic assistance and meals to students of any grade level and pairs them with a LEAD for one-on-one and small-group learning sessions. The University and the Brewers initiated discussions last summer to include a Learning Lounge facility as part of the proposed renovation of Maryvale Baseball Park, the 19-year-old facility that has been widely enjoyed by the community. The expanded and renovated facility is expected to be ready by the start of 2019 spring training. 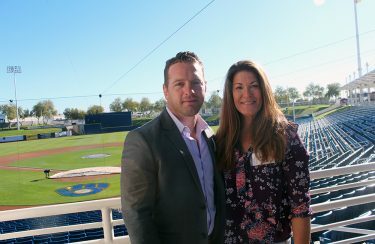 Fantastic – great job Brewers, Grand Canyon University, and city of Maryvale for working together for the greater good. I hope that others are watching and will generate similar win-win projects for their communities. Lopes Up! I also lived in Maryvale as a child and am a GCU alum. So pleased and proud!